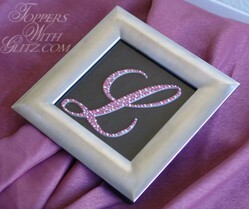 here are many different ways of showcasing your crystal monogram cake toppers. While I don't sell any of the items displayed, I've created this page to share some of the ideas that have been brought to my attention. 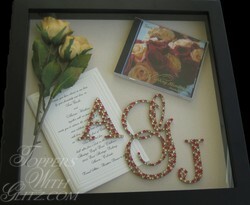 As pictured (right), you can collect your favorite or most sentimental items from the wedding, and display them in a shadowbox. What better way to fill the empty spaces of your shared home than with all the reminders of your wedding day? Common items include flower petals, stems from bouquets, cocktail napkin, invitation, a sample favor, marriage certificate, garter, vows on actual paper they were read from, and of course, your cake topper! 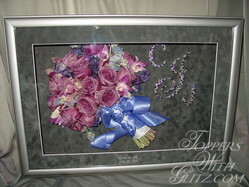 Another option is to include your cake topper in the encasement that is used to store your bouquet. Freeze-drying can be done professionally but has to be done as soon after the wedding as possible, while the flowers are still fresh. The photograph to the left was done by a preservationist in Ohio. A simple way to display a 1/8 inch thick crystal topper is to frame it! Simply use an 8x10 or larger frame, your choice of matte, and you're done. If your walls are already covered from floor to ceiling or a shadowbox just doesn't go with your decor there is still a way to commemorate your wedding and put your crystal monogram topper to good use: decorate your Christmas tree with it! 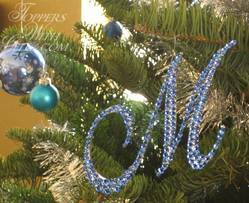 Single letter toppers, or the middle letter of a three letter monogram, can adorn the top of your tree like they do the tops of cakes. 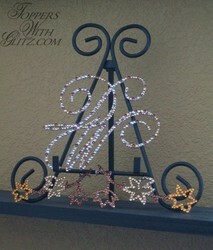 What a unique and modern way to mark your families tree!? Letters less than 4 inches, including the side letters of a three letter monogram, make for sparkly light weight ornaments. Loop some ribbon around a curly part of the letter and voila!